Cebu Pacific Air is planning further expansion of its long-haul network in 2015 but, at least for now, has shelved plans for growing its widebody fleet beyond six aircraft. The Philippine LCC is wisely waiting to see how its long-haul operation, which had a load factor of only 53% in 4Q2014, matures before committing to more A330s or new-generation widebody aircraft. Cebu Pacific took delivery of its sixth A330-300 in Mar-2015. The airline is currently using its widebody fleet to operate only four long-haul routes – Dubai, Kuwait, Riyadh and Sydney – but the type is also currently being used on three short-haul routes. Manila-Doha is being launched as Cebu’s fifth long-haul route – and fourth to the Middle East – in Jun-2015. Cebu Pacific is also seeking additional traffic rights to the UAE which would be used to launch services to Sharjah. While the Middle East remains the main focus of Cebu’s long-haul unit, the LCC also aims to begin serving Honolulu by the end of 2015 and is keen to secure more Australia rights to enable the launch of services to Melbourne. This is the first of a two part analysis reports on Cebu’s long-haul operation. Part 1 will focus primarily on its operation to the Middle East. The second part will look more closely at Cebu’s plans for Hawaii and potential expansion in Australia as well as how it will continue to use its A330 fleet on short-haul routes. Cebu Pacific launched its long-haul unit in 2013, when it took delivery of its first two 436-seat A330-300s and began services services to Dubai. Cebu Pacific did not launch its second long-haul route until Sep-2014, at which point it had a fleet of five A330-300s. The airline initially focused primarily on using the A330 to increase capacity on domestic and regional international routes. This was a sensible approach given the initial performance on the Manila-Dubai route and the opportunities Cebu Pacific had to up-gauge short-haul flights from A320s to A330s. Cebu Pacific’s long-haul division began a new chapter in early Sep-2014 as it launched four routes within a span of only five weeks – Dammam, Kuwait, Riyadh and Sydney. Not surprisingly the rapid network expansion proved to be challenging as new long-haul routes typically have a longer spool-up period than short-haul routes. Cebu Pacific also quickly realised Manila-Dammam was a particularly challenging route and decided to suspend Dammam from 30-Mar-2015. Cebu Pacific reported in its 4Q2014 results presentation an average load factor across its five long-haul routes (including Dubai and the four new routes) of only 53% for 4Q2014. Cebu Pacific had a similar initial experience with the Dubai route after its Oct-2013 launch. Cebu Pacific recorded an initial load factor of only 36% in its first month of operating Manila-Dubai. Performance on the Dubai route has gradually improved over time. For the full year in 2014 Cebu Pacific’s average load factor on long-haul routes was 61%. This mostly reflects its performance in the Dubai market as the UAE (Dubai or Sharjah, which was served temporarily during runway works at Dubai) accounted for more than 60% of total Cebu Pacific long-haul ASKs for the year. Cebu Pacific executives said during the carrier’s 4Q2014 results briefing that its long-haul operation incurred a loss of about PHP1 billion (USD23 million) in 2014. This includes continued losses on Manila-Dubai as well as start-up costs for Dammam, Kuwait, Riyadh and Sydney. The profits the A330s generated on short-haul routes, which Cebu Pacific stated were substantial, are not included in the PHP1 billion figure. Cebu Pacific should continue to see improvements in Dubai and is confident it will also see gradual improvements in 2015 across the three new long-haul routes it has maintained. In the Manila-Dubai market Cebu Pacific should benefit from Emirates' reduction at the end of Jan-2015 from three to two daily flights. Cebu Pacific currently operates one daily flight to Dubai, a schedule it plans to maintain although for some of 2014 it cut back to a less than daily schedule. Sydney, which was launched on 9-Sep-2015 with four weekly frequencies, is currently served with five weekly flights. Kuwait, which was launched on 2-Sep-2015 with three weekly flights, is currently served with four frequencies. Riyadh, which was launched on 1-Oct-2015, is served with three weekly flights. Dammam was also served with three weekly flights during the six months it operated (5-Oct-2014 to 30-Mar-2015). According to Cebu Pacific's online booking engine Sydney is being reduced back to four weekly frequencies in Jun-2015 as Cebu Pacific launches Doha, which will be served with two weekly flights from 4-Jun-2015. Note: Cebu Pacific continues to use A320s on most flights to Cebu, Davao and Singapore. It began using A330s on some flights to these destinations in 2013. Cebu Pacific's A330 schedule on short-haul routes – which currently includes 17 weekly flights to Davao, four weekly flights to Cebu and one daily flight to Singapore – will remain unchanged in Jun-2015 (based on schedules in OAG). But Cebu Pacific is planning to start using the A330 on more short-haul routes in 2H2015, which should enable the carrier to boost average aircraft utilisation levels. CAPA will examine these plans and the overall use of the A330 fleet in the next instalment in this series of reports. Competing in the Manila-Doha market could be challenging as Qatar has a much smaller community of Filipinos than Saudi Arabia or the UAE and a slightly smaller community than Kuwait. But Cebu Pacific is taking a low risk approach as it is launching Doha with only two weekly flights (all its other long-haul routes have launched with at least three weekly flights). PAL’s withdrawal from the Manila-Doha route, which it operated for about six months in late 2013 and early 2014, leaves a potential opening for Cebu Pacific. Qatar Airways also reduced capacity in late 2013 on the Manila-Doha route from two to one daily frequency. Qatar has since operated one daily flight to alternative airport Clark but Manila is generally considered a much more convenient airport for most Filipinos. The shift of second frequency to Clark was necessary after Qatar ended an unusual codeshare arrangement with PAL, which enabled Qatar to use PAL’s traffic rights for its second Manila frequency although the flight was Qatar-operated. Emirates more recently was similarly forced to cut its third frequency to Manila after the same type of codeshare partnership with PAL ended. Cebu Pacific was a staunch opponent of these arrangements as Gulf rivals were able to use traffic rights intended for Philippine carriers. Cebu Pacific is targeting a different sector of the Philippines-Middle East market from those of its Gulf competitors although there is obviously some overlap. Cebu Pacific is focusing almost entirely on migrant worker and visiting friends and relatives (VFR) traffic. In deciding in 2012 to establish a long-haul unit Cebu Pacific determined most of this traffic was flying between Manila and the Middle East on one-stop carriers. While Emirates, Etihad and Qatar carry a relatively large volume of Filipino workers based in the Gulf, they focus more on markets beyond their hubs, particularly the Philippines-Europe market. Kuwait Airways, Oman Air and Saudia also serve Manila. Cebu Pacific competes against Kuwait Airways on the Manila-Kuwait route but Cebu Pacific is the only non-stop operator as Kuwait’s six times per week Manila service operates via Bangkok. Oman Air launched services to Manila in late 2014, resulting in a new one-stop competitor in the Manila-Middle East markets served by Cebu Pacific. The new route from Oman has been successful but Oman Air is mainly focusing on the local Manila-Oman market and connections to Europe. See related report: Oman Air outlook Pt 2: can rapid growth, airport upgrades and transit traffic lead to profitability? Saudia serves Manila from Jeddah, Riyadh and Dammam with a total of 12 weekly frequencies, according to current schedules in OAG. Saudia is a tough competitor as it focuses mainly on the local Philippines-Saudi Arabia market. PAL also competes in the Manila-Riyadh market, which it entered in late 2013 and currently serves five times per week. 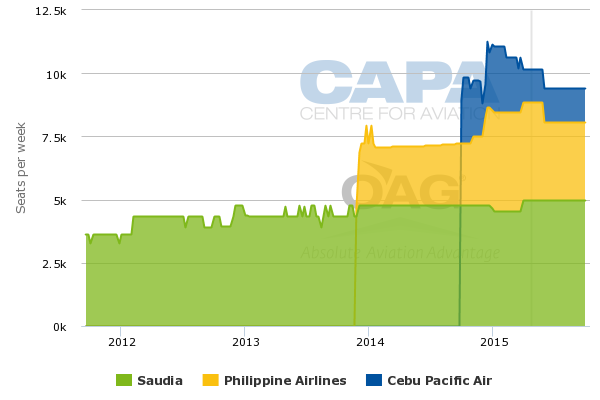 Cebu Pacific currently accounts for only about 13% of non-stop seat capacity in the Philippines-Saudi Arabia market compared to about 38% for PAL and 49% for Saudia, according to CAPA and OAG data. Cebu Pacific briefly captured over 20% of capacity in this market while it operated to Dammam. Even with Cebu pulling out of Dammam total seat capacity in the Philippines-Saudi Arabia market has more than doubled since late 2013. Cebu Pacific could bolster its position in the Philippines-Saudi Arabia market if it is able to implement a potential partnership with flynas. The Saudi Arabia-based LCC would give Cebu Pacific an opportunity to sell domestic connections beyond Riyadh, including Dammam. Short-haul international connections are also possible beyond Riyadh. By using Riyadh to serve offline markets in the Middle East as well as parts of Eastern Europe Cebu Pacific could potentially increase capacity on Riyadh beyond the current three weekly flights. A potential partnership with flynas as well as UAE-based LCC Air Arabia would enable Cebu Pacific to not rely entirely on the point to point market. While the business case for the Cebu Pacific long-haul unit was always based purely on local traffic the opportunity to provide connections beyond its Middle Eastern gateways should boost load factors and the overall performance of its long-haul operation, particularly during off-peak periods. Cebu Pacific had a marketing tie-up with Air Arabia during its time serving Sharjah in mid-2014 while there was runway works in Dubai. As CAPA previously outlined, Cebu Pacific has since been keen to launch regular services to Sharjah, which would enable it to forge a more comprehensive and permanent partnership with Air Arabia. The Sharjah flight would complement and not replace Dubai as Cebu Pacific sees Sharjah as a separate market with strong local demand from Filipinos working in that part of the UAE plus connections on Air Arabia. Cebu Pacific is now in the process of applying for additional Philippines-UAE traffic rights, which it would use to launch services to Sharjah. The rights should be available as Filipino carriers are currently only using 18 of their 28 available weekly entitlements. This includes 11 weekly flights from the PAL Group and seven for Cebu Pacific. The PAL Group currently operates five weekly flights to Abu Dhabi and six weekly flights to Dubai, according to OAG. The Dubai flight was recently handed from PAL Express to PAL mainline, which already operated the Abu Dhabi route. But there is no guarantee Cebu Pacific will receive additional traffic rights for the UAE. The PAL Group also is interested in increasing its capacity to the UAE. More flights to Abu Dhabi are likely for PAL given the flag carrier’s recently expanded codeshare partnership with Etihad. Currently Etihad operates two daily flights to Manila and is unable to expand on the route on its own as the UAE carriers are now fully utilising their 28 weekly entitlements (the restrictions are imposed from the Philippine side). The PAL Group, which launched both Abu Dhabi and Dubai in 2H2013, currently has about a 24% share of non-stop seat capacity between the Philippines and the UAE. Cebu Pacific has a 17% share while Emirates has seen its share of the market drop to about 30%. Etihad also has nearly a 30% share of capacity in the Philippines-UAE market. 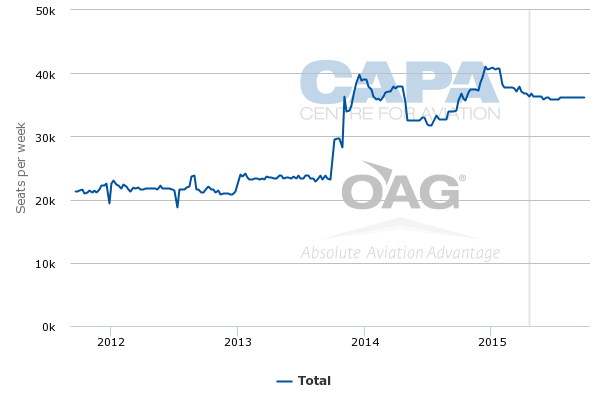 Total seat capacity in the Philippines-UAE market is currently up by about 33% compared to Apr-2013 but is down about 23% compared to Apr-2014. The reduction, which was driven mainly by the cut at Emirates, should leave an opening for further expansion by Cebu Pacific and/or PAL. The Philippines-UAE market could potentially support more capacity, particularly during peak periods. 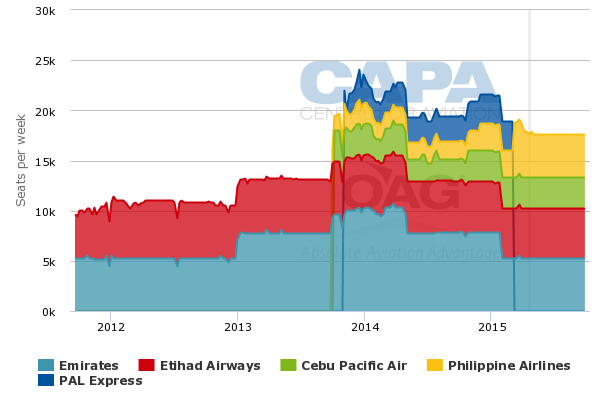 Naturally it took time for the sudden surge in capacity by Filipino carriers from 2H2013 to be absorbed. In the broader Philippines-Middle East market, total non-stop seat capacity has increased by about 60% over the past two years. Cebu Pacific will account for about a 19% share of non-stop capacity in this market in Jun-2015, at which point it will be operating four routes to four countries in the region, compared to zero Jun-2013. Cebu Pacific has a much larger share of the actual market as a majority of passengers carried by the three main Gulf carriers, which still account for about 40% of total capacity, are connecting to flights beyond the Middle East. Cebu Pacific has been successful at securing a significant share of the Philippines-Middle East market in a relatively short period and has stimulated demand with its low fares. But Cebu Pacific’s operation in the Middle East, which was always the main target for its long-haul unit, has faced challenges and has so far been highly unprofitable. Cebu Pacific is confident its long-haul operation will broadly break even in 2015. The airline expects an average load factor across its long-haul network in 2015 of more than 70%. Higher yields and lower fuel prices will also help drive the hoped for turnaround. Cebu Pacific has already noticed a significant improvement on Dubai, Kuwait and Riyadh in 1Q2015. “My sense is we are over the hump with the long-haul operation,” says Cebu Pacific CEO Advisor Garry Kingshott. The anticipated improved performance of the long-haul operation hinges on a significantly better performance in the Middle East market, which will account for approximately 75% of its long-haul capacity in 2015. Cebu Pacific could potentially increase capacity to Australia (its only current long-haul destination outside the Middle East) and is planning to launch services to Hawaii, but not until late 2015. Cebu Pacific is banking on the Middle East as it tries to prove it made the right decision in 2012 in taking the long-haul low-cost plunge. Given the reduction in fuel prices and the fact Cebu Pacific has now had plenty of time to iron out the initial kinks and get accustomed to the intricacies of the Middle East market, 2015 is likely to be a make or break year for the long-haul operation.